More often than not when considering our next purchase for home decoration, our decision is determined solely by the price of the canvas. At times, an impressive number on the price tag can truly indicate a high-quality performance. However, this is not always the case. Let us take a look at what determines a high-quality product and why cheap canvas prints do not necessarily mean bad canvas prints. What Is the Photo Canvas Print Actually Intended For? Before we get into this, we must have a quick overview of what the original purpose of canvas print actually is. Mostly bearing a stock image or a photo of the owner’s choice, the photo canvas print consists of a canvas fabric that’s stretched over a wooden (preferably) framework or is gallery-wrapped around a stretcher frame. Their basic function is to complement the interior they’re placed into, emulating the look of actual oil and acrylic paintings. Frankly, it’s a less expensive alternative of a painting, and for the very same reason, it’s also a more popular one. Ask millions of millennials who decorate their interiors with these little, personalized pieces of art. When it comes to printing our beloved photos, it’s the details, contrasts, and resolution that matters the most. If these are combined with a quality framework and durability, you have hit the jackpot. With that said, there are certain hints that you might just have missed one. First off, it’s all about the edges. If the canvas does not stretch over the middle point of each stretcher bar (there’re four of them in the most classic version) and the clamps used to hold it in place are unevenly distributed, you might have a problem. It’s a strong indicator that the canvas might not be optimally stretched, and, as such, it will probably detach from the frame in a matter of months. More often than not, this defect justifies the low price you paid for the item. With that said, it’s not something that applies to all low-cost product manufacturers and distributors. Case in point, CanvasDiscount.com employs highly sophisticated machinery that cuts each textile with the same exact size ratio (within a single size category) while the clamps are manually and evenly tucked in by skilled workers. However, that’s a quality standard CanvasDiscount.com does not ask additional money for. The client’s satisfaction is essential to our goal and success, and the best way to earn it is by giving the beloved photos a foundation that does not fail its owner. The next essential is, of course, the stretcher frame itself. This too suffers from a myriad of issues if the manufacturer has decided to go the easy, cost-effective, short-term road. All of this is done in order to avoid the negative influence of the climate, as the fiber of the canvas is prone to changes in humidity, temperature, and sunlight. Once the canvas gets too heavy, it will surely become too loose. And that, in turn, leads to a creasy image. This is easily the most popular canvas defect out there. Without being able to check the quality with your own hands, all you can do is careful fact-checking. 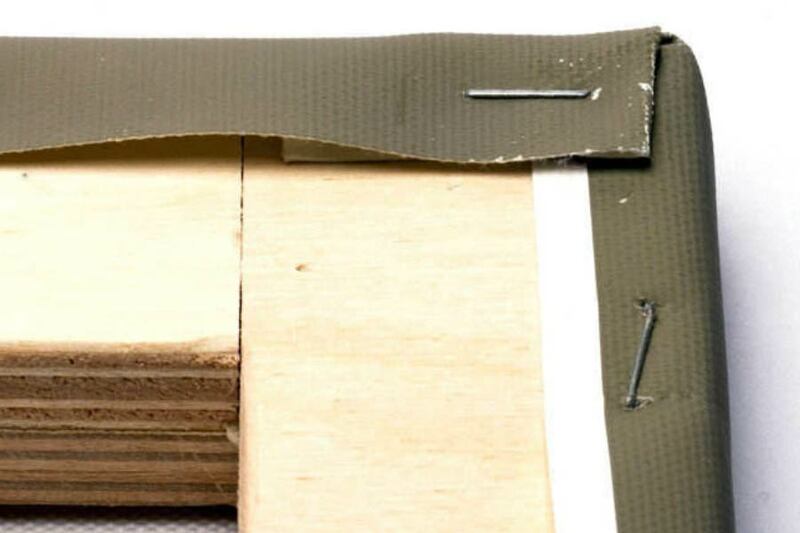 Spruce and pine woods are the most widely used materials for the production of canvas stretcher bars. And, they’re also the most trustworthy when it comes to endurance. Pay attention to the type of tree that’s being used in production, and, if it’s indicated, whether it has gone through industrial drying. Now, the thing with canvas prints is that the original color palette will be somewhat subdued by nature, as the specifics of the canvas fabric mutes the original hues by default. However, this is never apparent enough to be seen as detrimental to the overall experience. Most manufacturers will go great lengths to convince potential customers that their image quality is far superior to the competition, while, in all honesty, one simply cannot make it that much better. That is if you don’t substitute the regular canvas with a different matter. The quality is ultimately decided by the printing technology and its capability to reproduce and, perhaps, even enhance the sharpness and contrast of the original image, all while staying environmentally-friendly and harmless to those suffering from allergies. HP latex inks used in our factories are able to provide all of the above mentioned, yet we still retain the low-cost policy, as the streamlined production process is cost-effective and ergonomic enough to allow us to keep up with this premise. A cheap price is not a flaw no matter how often manufacturers and service providers have proven the opposite. Lastly, canvas quality often has a lot do with the red carpet presentation it receives. Now, you might have encountered terms such as “giclée” and “museum quality”. While it sounds all clever and pretty, these terms are often used without any other merit than that of justifying an overpriced item. Of course, any sensible manufacturer will try to prettify its product, but using essentially meaningless terms like these can be easily seen as flat-out false advertising. Make sure to read the reviews or watch video ones if there’s a chance to see how this product feels and sits within an actual environment! While cheap canvas prints might often justify the price tag in the most negative sense of the word, there’s enough information floating around to do a little research before the actual purchase. Our only advice? Always look for the middle road! While sensationally cheap canvas prints are a strong indicator of a second-rate manufacturing practice, high-end canvases are often overpriced because of some seemingly revolutionary printing technique or special processing, while the end result is mostly just a normal, reasonable quality canvas. Without any faux promises, CanvasDiscount.com will deliver one for half the price. This really is a case when cheap canvas prints don’t stand for bad-quality ones!